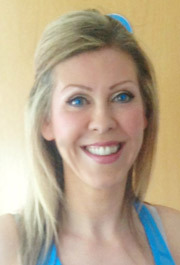 Hi, My name is Karen and I am an Advanced Level 4 Personal Trainer and Sports Massage Therapist. I have been in the Fitness industry for over 9 years now and I have a huge passion for helping people to become fit and healthy. I have worked all over the world, beginning my career training and massaging clients onboard Luxury Cruise Liners. Many of my clients seek out the benefits of a Sports Massage to release daily muscular tension and restore balance to the body in general. If you have sore, aching muscles, problems with movement and flexibility and general tension. I can help you rid the body of constant irritable pain. Let me invite you to try the difference a massage can make to the body. Book in now for a 30 min massage normally £30 and get the 2nd half price £15. Do not hesitate to contact me, I am happy to answer any questions you may have and will look forward to meeting you.